Now I, Johanna, is back and I have Sebastian here with me. Soon it is time for new exiting projects, but unfortunately that means that our time at the Stockholm office is ending. So, we thought that we should share some precious moments from this period with you. 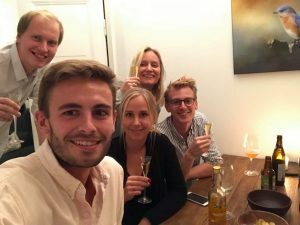 Here at Stockholm office we have been five trainees and we have really gotten to know each other well over the past three months. As we remember it, “morning sandwiches” (read breakfast) was our first routine here at the office and we had so much fun together that these routines escalated quickly. Lunch became more frequent and before we knew it everybody just showed up at noon every day to have lunch together. But wait, that’s not all! 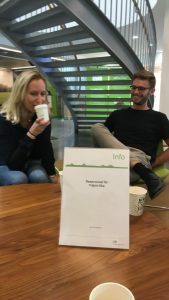 Everyone needs a short break in the afternoon, so why not take it together over a quick fika? Okay so now we might come off as a bit codependent. At an early point our super receptionist Jörgen made us our very own fika-sign. Se the excitement over the sign in the picture below. 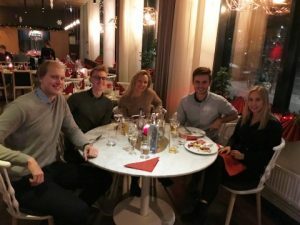 One thing that became clear during all the fika and lunches was that the group seemed to be very competitive and we realized we wanted to challenge each other. This led to hours spent competing in tennis, bowling, badminton, racket ball, shuffleboard and mushroom picking. Mikkel usually lost (or maybe not?). 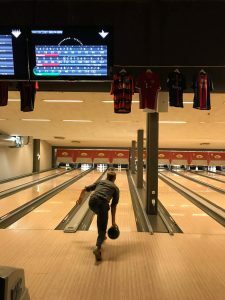 Above: Hugo bowling, go go! Above: Lovisa cheering on her team! Apart from that we have had the time to celebrate some birthdays and go to some after works. 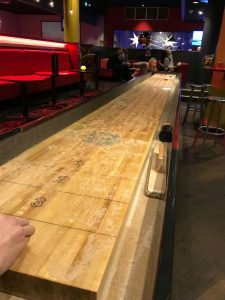 But the most magical time of the year is now (Christmas is almost here) so we took the opportunity to go to a julbord (Christmas buffet) and play shuffleboard as a way to conclude this amazing first period! Above: During Mikkel’s birthday we were invited to his fantastically beautiful apartement. Above: Julbord with the gang. Next week we will attend a recharge with the whole trainee group 🙂 and after that we will start our next projects. Very much looking forward to that even though we will miss each other and our current colleagues. That was all for now! Happy weekend!